Happy Wednesday! There are two flash sales I wanted to share before they end. I’ll be working on a new blog post with lots of try-ons this weekend. Stay tuned and thanks for your patience! I had a take a break last week due to coming back from vacation and a busy week at work. 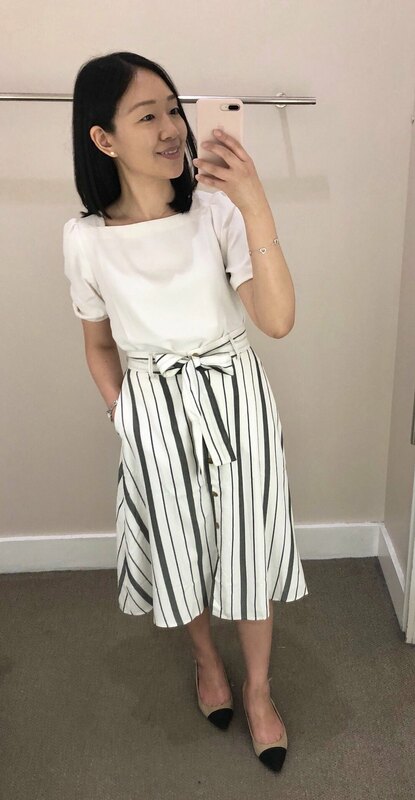 This a-line skirt (see it on my friend Lilly) is one of my favorites and it’s currently 50% off. I tried on size 0 regular which was a big loose so I ordered my usual size 0P to try since it looks like size 00 regular sold out online. This square neck blouse is not part of the sale but it runs true to size. It’s a thicker polyester material so it’s not sheer. I fit sizes XXSP and XSP but size XXSP tucked in more cleanly. LOFT – Get 50% off select full-price styles, save an extra 50% off sale styles and save an extra 60% off select sale styles. Use code FLASH. Valid online only. Sale ends Friday 6/8 at 3AM ET. Click here to see what I ordered late last night when it was still an extra 15% off and my order has already shipped! This lace bib blouse (review here) and this lacy ruffle cold shoulder blouse (review here, last seen here) are now on final sale for only $11.95 after discounts! This frayed denim jacket (review here) is now only $20 after discounts. Ann Taylor – Get an extra 60% off sale styes. Valid online only. Sale ends 6/7 at 12AM ET. Shop new to sale styles here. I received this vintage floral sheath dress and my usual size 0 petite fit well in the waist but the bust was a bit loose since I have a smaller chest. Yesterday I ordered this linen blend ruffle Newbury blazer in size 00P based on trying on the seersucker version which I reviewed in this post. Hopefully the linen blazer fits similarly since it’s the same style. Update 8PM ET: I just received this lace trim scoop neck sweater tank in size XXS regular tonight and it fits true to size. See the white color on me here. The laurier rose color is currently an extra 60% off making it $18 after discounts. It tucks in clean with this floral eyelet pencil skirt (c/o, last seen here, featured here) which is now $28 after discounts. I also separated LOFT and Ann Taylor new arrivals and I made a new page specific to Ann Taylor sale/clearance items. The latest cardmember coupon (yes finally!) and $15 cardmember birthday coupon for June can now be found on the bottom of the sale alerts page. I’ll be sure to mention this again in my next blog post since I’m currently adding a few tidbits to this post after I’ve already hit publish. Lastly, I always share daily deals and steals on my Insta Shop so please read the captions for sale details and sizing. Feel free to message me if anything is unclear.